Wide Collection Of Wedding Jewelry Set in Golden & Copper Pearls Jewelry In Intricate Classic Grape bunch of Pearls Pendant 2 colors Golden & Copper Pearls exquisite choker Necklace & earrings are handmade drop down Pendant with 100% GENUINE Swarovski Pearls accented silver chain Perfect with any outfit Superr Grade RARE HIGHEST QUALITY. Good shinning surface quality with unique attractiveness & fashionable flair to this stylish. What is in this season? Check this out! 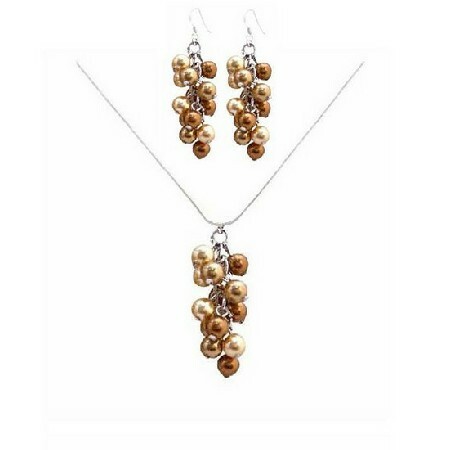 Necklace Set a trendy Necklace a perfect piece for anyone to wear for a formal or casual occasion!.